They say two heads are better than one. Well, what about two fans. The auto shop had fans on special - two for the price of one. So, for $109 I could have got two 16" fans. Used on for the car and the other for a paper weight. 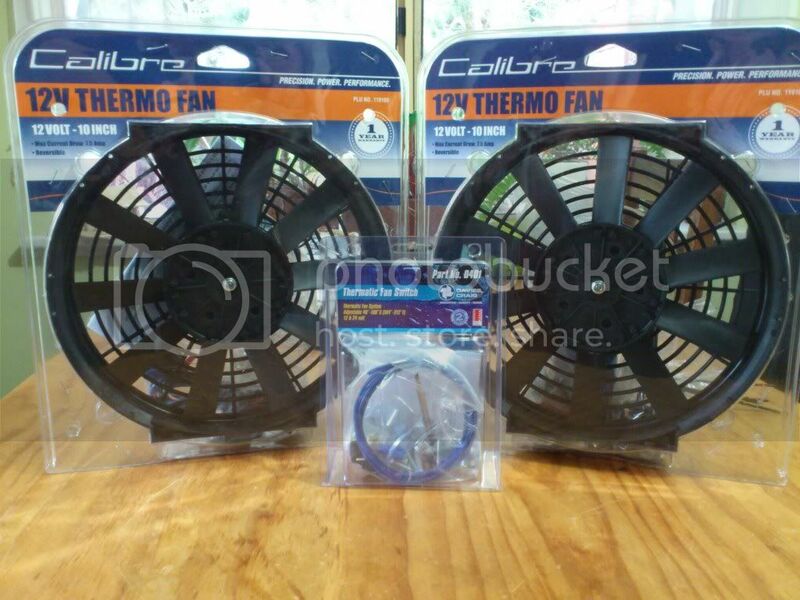 So I bought two 10" fans for $69. They fit across the radiator with about 1cm each side overlapping. With a strip of 1cm thick high density foam around the bottom of the fan. Set up with a Davies Craig variable thermal switch. just ordered 16 inch fan along with 200 on/185 off relay. How did your dual fans work out on your trip? Great! Being the worrywart that I am, I hooked up an LED to see when the fan came on, to make sure it cut in. Well since putting the fans in, they hardly ever cut in - on the highway and around town. Mind you, they did work for their money. On the way back home we had a head wind and it was 48 degrees celcius in the shade (118 farenheight) <img src="/forums/images/graemlins/evil.gif" alt="" /> . It was a lot hotter on the black top, the bitumen was peeling off the road as trucks were driving over it. Now that I'm sure they both work I have removed the LED. Having the twin fans is a bit noisier. I took the bonnet sound damping mat off a '97 and it helps a bit. It does make it a bit warmer under there though. FYI, the belt seems to be the same for a lot of cars. looking for a 4 rib, 335mm belt. comes on a lot of miatas apparently. gonna pick one up tonight from advance auto. # 335k4. christ almighty! just picked up a tap and drill set for the temp sender.. $55!!!! I have an LED mounted in the dash for my fan, it's nice to have. With a new radiator, the fan is never on for more than 2 minutes, even when blasting down a trail or sitting in traffic on the 405. I did make a "custom" bracket to mount it, because those damn ties that go through the radiator ripped one of the passages. "Does this part need to be in there?" 1996 Dodge 1500 single cab / short bed, 5.9 4x4; 2" lift (springs not blocks), C.A.I and more mods to come. I have been using a SPAL fan-pwm v3 for a long time. I've been using the stock temperature sensor (the one that signals the ECU, not the one for the temperature gauge). The problem I started having was sometimes the fan controller would get into some kind of error mode where the status LED would flash rapidly. I looked up the error codes in the FAN-PWM manual and there wasn't a code listed for this behavior (just rapidly flashing, no pauses between flashes). I actually replaced the FAN-PWM thinking maybe it was bad, but the new unit has the same problem. A couple times I didn't notice the LED flashing (didn't put it up high enough on the dash) and my engine started overheating. Scary, I could have killed my engine because of this problem. I rewired everything and replaced the fan with a SPAL fan that draws less current. Problem still wasn't fixed. Checked the voltages supplying the unit, they don't seem too far out of spec. Only thing I can think of at this point is maybe the stock temperature sensor is sometimes flaky, which confuses the FAN-PWM making it throw an error, or else maybe the FAN-PWM unit gets too hot under the hood sometimes and goes into an error mode. Honestly though I am just guessing at this point. It is frustrating. So, basically, long story short, this FAN-PWM works at least 95% of the time, but when it fails, it is dangerous as it can cause the engine to overheat while stopped in traffic if you don't notice it. If I notice the error code flashing, I can simply turn my engine off and back on again, then the FAN-PWM works fine! Crazy thing. 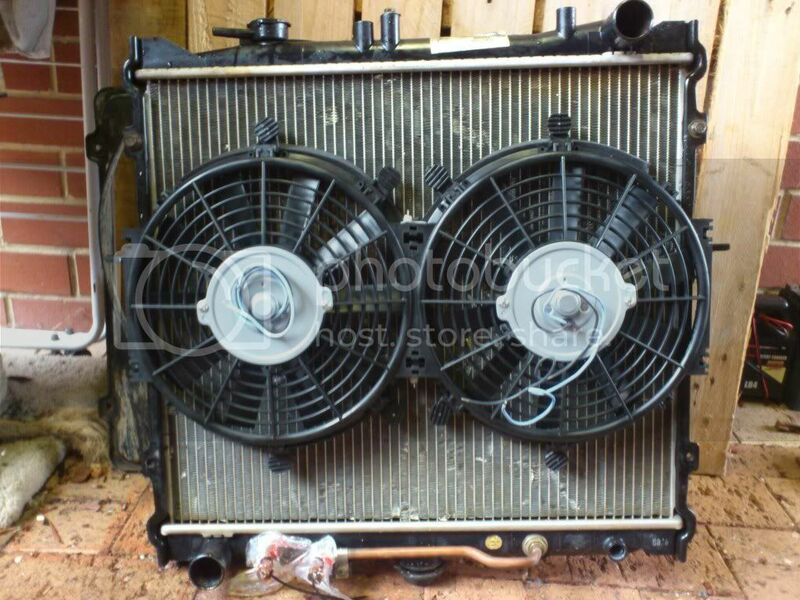 So since it is no longer 100% reliable, but works well MOST of the time, and I need this car to be reliable for my pregnant wife to sometimes drive, I came up with a failsafe system that would engage the fan in case the SPAL fails. I will wire this up to a simple relay so that when this temperature switch kicks in, the relay switches. Then I will splice the relay into my FAN-PWM wiring harness so that when the relay is NOT turned on, the fan is powered by the FAN-PWM unit. When the relay turns on, the circuit with the FAN-PWM is broken, and the fan will be powered straight off the battery (with a fuse inline). This will bypass the FAN-PWM when the engine gets too hot and turn the fan on. It blows my mind that the FAN-PWM wasn't designed to just run the fan anyway when it hits an error condition. It seems like that would be the logical failsafe they would program into the unit... If something goes wrong and you're flashing an error code and you don't know what to do, at least run the damn fan so the car can't overheat and destroy the engine! Anyway, done ranting. I am going to wire it up this way, for now, but it's tempting to just strip out the FAN-PWM unit instead, and run ONLY off of this simple temperature switch. I could easily wire in an extra bypass to engage the fan when the AC compressor is on, too. The only thing I'd lose is that the FAN-PWM has programmable temperature thresholds, and can run the fan on "low" when it doesn't need to run full speed. I used to think all that was nice but at the end of the day, the most important thing is that the damn fan better spin when the engine gets too hot. 2002 Sportage 4dr 4x4 soon to undergo an Extreme Makeover! Oops.. Well I feel stupid now. I don't know why i didn't think of this before (and the SPAL tech support guy on the phone didn't think of it either) but, the remote status LED on the dash is NOT the same as the status LED on the controller unit itself (which is under the hood). So, when the status LED on the dash is blinking, that just means there is SOME error. If you pop the hood and look at the LED on the FAN-PWM unit itself, that is where it would flash the code telling you what the error is. I haven't tried this yet (I don't have any surefire way to trigger an error code) but hopefully I will catch the error happening some time in the near future so I can look under the hood and see what the error was! Fine with me if that's the case... then I can use the temperature switch and relays and stuff to do an electric fan install on my pickup truck <img src="/forums/images/graemlins/notooth.gif" alt="" /> That would be a fun project!